You're Invited to the NamePros Holiday Party! Home > Current Events > You’re Invited to the NamePros Holiday Party! You’re Invited to the NamePros Holiday Party! 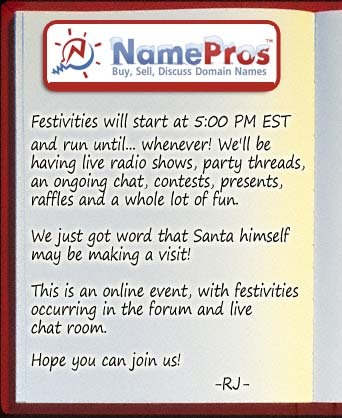 NamePros is going to have a fun filled Christmas Holiday Party and you’re invited! There is a growing list of cool items, services and domain names that are being donated to a raffle drawing. Special forums have been setup for wild and crazy holiday fun. The chat room will be buzzing with happy domainers. Festivities start at 5pm EST Friday the 21st and will end when the last person passes out! Make sure to stop by, I’ll be there. DotSauce has donated a free 2 months Premium Subscription to the raffle, be sure to buy some tickets! Don’t forget to enter the DotSauce Christmas Tech Toys Giveaway for a chance at one of ten awesome prizes.